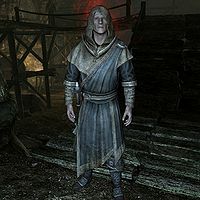 Volk is a Nord Vigilant of Stendarr found in Ruunvald. He came there to help with the excavation after Moric Sidrey requested more assistance. From the information found in his journal, he may have been the last member of the Vigilants left unaffected by the warlock Minorne's charms. This page was last modified on 31 March 2013, at 21:05.